Theia is a perfect combination of a smart price and comfort. Price already includes nitrox, wifi, and taxes, so you don't have to worry or count expenses. The lounge area with panoramic view and a sky bar offers a total relax. Boat's guest will explore the best and the most well-known itinerary of Maldives - Central atolls with numerous manta cleaning stations. 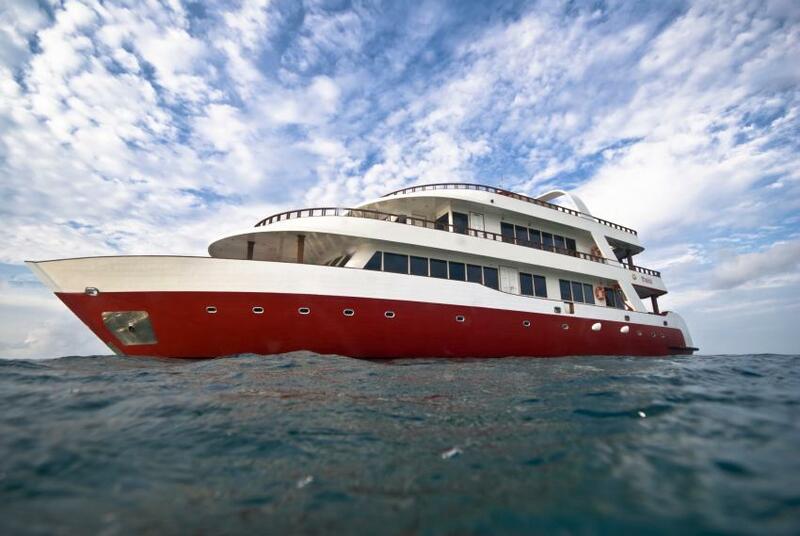 Theia Liveaboard can welcome 18 guests. Cabins located on the lower deck can be shared or booked per double occupancy. They have one double and one single bed. Main deck cabin has a double bed. On the upper deck stateroom, you will get a sea view in addition. Two cabins have a double and a single bed and one room equipped with convertible beds. The boat has plenty of space to relax after diving. You can stay in a spacious salon area or observe the view. Theia Liveaboard has a perfect sun deck to enjoy outstanding Maldivian sceneries. Crew team of Theia liveaboard pays special attention to the safety on board. There are life jackets in each cabin. A boat has all the necessary facilities to ensure your safety during a safari, including a rescue system. Dive deck on Theia liveaboard has plenty of space for every driver to feel comfortable and to prepare for the dive. Here divers will find many of storage boxes for their diving gear. Theia can be a perfect boat for romantic trips. On board, you can enjoy gorgeous views of Maldivian Atolls. Sea View cabins thanks to its stunning marine view can be ideal for newlyweds. They can spend time in a relaxing atmosphere of a luxury yacht, try diving with a variety of creatures and get many new impressions. Theia itineraries include such Central and North Atolls. You will have a chance to explore like Vaavu Atoll, Meemu Atoll a Lhaviyani and of course Ari and Male Atolls. While diving on North atolls divers can often meet hammerheads and mantas. Vaavu Atoll is famous for its coral reef. It’s home for Napoleon wrasses, tuna, giant trevallies, stingrays. Some of the dive sites of Vaavu atoll would be good for snorkelers too. Diving on Meemu Atoll gives an opportunity to meet great dolphins and whale sharks. Lhaviyani Atoll is full of marine life. This destination is famed for its beauty and abundant sea life, and some of the best scuba diving sites in the Maldives. Central atolls can be considered as a must-see for the Maldives. It is the perfect start to introduce with the Maldives diving. Manta cleaning stations, caves and thilas, chance to meet whale sharks and lots of colorful fish- it's all about Central Atolls. Diving on the Maldives is possible all year round. It is always good visibility and a comfortable temperature of water. Best time to dive here is in winter months and at the beginning of Spring. Currents in a time of year bring more different fish.